The article below first appeared in the August 2018 issue of West Michigan Woman magazine. I wanted to be sure to share this super fun project with you all! Thanks to the design genius of Kristin Thompson, interior e-designer at Postbox Designs and the photographic expertise of Aly Zuiderveen at Aly May Photo, I present to you my amazing, multi-functional “She Shed” (a.k.a home office/guest room/upstairs laundry center). She Said She Shed: A Space of One’s Own. Most of my days are spent taking care of my two boys: school drop-off, grocery shopping, changing diapers … Somewhere in the midst of those duties, I’ve also been building my online Honest Mom community. Even after establishing an LLC and business bank account, it’s taken awhile to embrace the fact that I’m a small business owner. Maybe that’s why I didn’t prioritize creating a home office space sooner into my “mompreneur” journey. Writing blog posts from our living room couch has led to innumerable frustrating situations, including the time my well-meaning toddler drenched my laptop with water—may it rest in peace. I finally realized if I was going to take myself seriously as a business owner, I should at least give myself a space to work without children climbing on me. That’s when I reached out to Kristin Thompson, Postbox Designs interior e-designer. I wanted to turn a drab spare bedroom into a bright, multifunctional space. My vision was to convert this space into an office/laundry/guest bedroom. It conveniently had two closets, one of which I imagined could be converted to house a stackable washer/dryer. To effectively transform the 130-square-foot space into a powerhouse of a room, I needed professional design help. I’ve known Kristin for several years and appreciate her impeccable taste, and her ability to work with any client’s style preference and budget. Kristin will source high-end furniture or score the best finds Target has to offer. In fact, my She Shed room is mostly furnished from Target, Ikea and Home Goods. There’s even a dollar store item in there! Adler snoozing while we shopped at Home Goods for this project. After we initially discussed the project, Kristin emailed my welcome packet. I sent back my design questionnaire and room layout. I filled a Pinterest board with my room inspiration: bright colors, Boho vibes, Mexican folk art. I also told Kristin we had a daybed and an antique desk that I wanted to make work in the room, although the desk didn’t fit the desired aesthetic. Kristin suggested a DIY desk makeover, noting the desk could be transformed with fresh paint and new hardware. My husband was worried we would ruin it. To our delight and surprise, the makeover turned out beautifully. The closet-turned-laundry center exceeded our expectations, thanks to our handyman. An upstairs laundry had been on my “dream home” list for ages. I love not having to lug heavy laundry hampers down two flights of stairs anymore. No disrespect to the longstanding tradition of the man cave, but it’s time for the She Shed to take center stage. Creating your She Shed may be more affordable than you think, especially if you’re willing to do some DIY projects and hunt for bargains. (My desk chair was a $20 thrifted find.) If you need me, you know where to find me—in my She Shed, reading a book on the daybed or writing at my desk. Ok, friends… how incredible did this room turn out? I can guarantee you this room would NOT have look this good without the help of Postbox Designs. Kristin made it super easy to bring my vision to life through her e-design services. To celebrate the big reveal of this collaboration, Kristin is giving all my Honest Mom readers $50 off your very own Postbox Designs Package. You can check out her packages here and just email Kristin (kristin@postboxdesigns.com) with the code “HONESTMOM” to receive your $50 discount. Kristin also made a “Shop This Room” freebie you can grab to make your own Boho “She Shed” space. Just go to sign up for her resource library HERE to get the free download (and you can browse tons of other great resources while you are over there)! What do you think of this multi-purpose “She Shed” room? Do you have a room in your home that you could turn into your very own personal “She Shed”? I’d love to hear your thoughts! What a beautiful and well deserved space! I am happy for you. 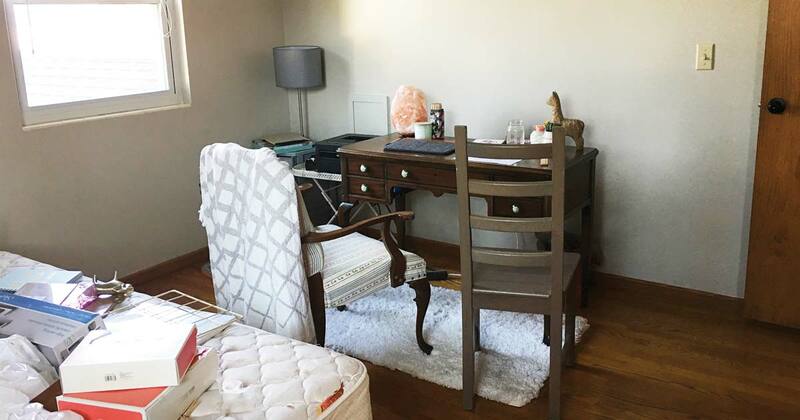 It is a beautiful space and just right for a busy Mom to reflect and work.